*You’ll find all the details for the giveaway down below the recipe! So I started maternity leave at the end of November, and our baby girl was born December 16. I was so lucky to have my husband at home for 3 weeks before and 3 weeks after she was born. It’s probably a good thing he went back to work because I was starting to feel guilty for how often I took advantage of him being around. So I’m still figuring out how this mom-of-a-toddler-and-a-newborn-and-a-food-blogger life is going to look for me. 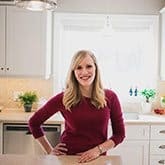 And I’ve had some amazing sponsors in the last few months, but I’m super thankful to be testing out some more simple recipes from the Cook with Campbell’s site for you. Because that’s something I can handle. 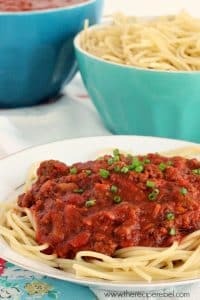 Spaghetti sauce is another one of those recipes I don’t usually use a recipe for, but I’m always intrigued to try an actual recipe for things that seem so simple to begin with. What I love about the recipe from Campbell’s is that it’s loaded with veggies (which I, well I kind of despise them, unless they’re cooked and fairly well-disguised) and that it’s made in the slow cooker. I made this the first day my husband returned to work, and I’m happy to say we all survived the day and the fact that everyone was well-fed was kind of just a bonus. I really didn’t change much about the recipe, aside from the fact that I added a finely chopped red pepper I had in the fridge and I shredded the carrot instead of chopping it so that the texture would be less noticeable. This was a total hit here! My toddler goes crazy for anything you serve with noodles, and the veggies were totally unnoticeable. Perfect for those picky eaters in your life (even if you’re one of them…. Lol). In a medium pan, brown ground beef until no pink remains. 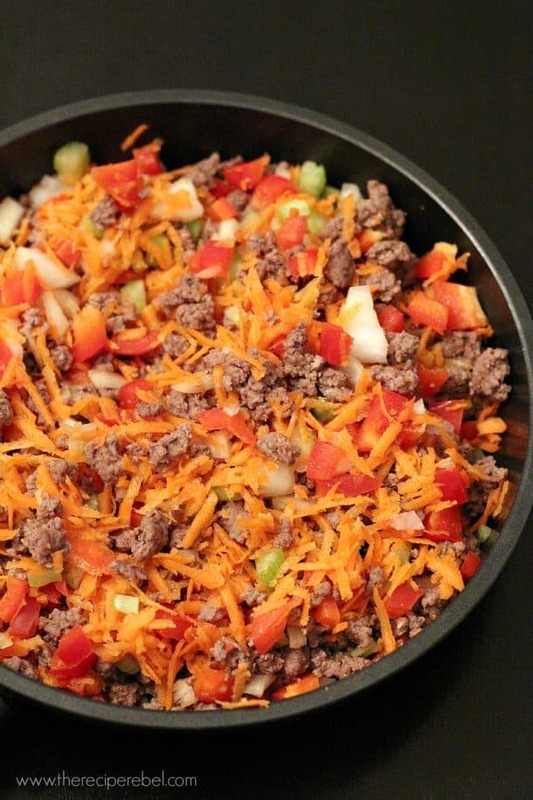 Add onion, carrot, celery, red pepper and garlic and 3-5 more minutes until veggies soften. Stir in soup and tomato paste. Add to slow cooker with tomatoes, broth, oregano, black pepper and bay leaf. Stir well. Cover and cook on high for 3-4 hours (stirring once half way through) or low for 6-8 hours. Stir, remove bay leaf and serve with parmesan cheese if desired. I always, always make a huge batch of spaghetti sauce and freeze it in smaller portions so it's easy to grab, thaw and heat for a quick meal! It works best to chill the sauce in the fridge before filling a Ziploc freezer bag or plastic freezer-friendly containters. Seal tightly and freeze. I always, always make a huge batch of spaghetti sauce and freeze it in smaller portions so it’s easy to grab, thaw and heat for a quick meal! It works best to chill the sauce in the fridge before filling a Ziploc freezer bag or plastic freezer-friendly containters. Seal tightly and freeze. All of these great bloggers definitely have a reason to celebrate! It’s time to mark another year of blogging for these lovely ladies. 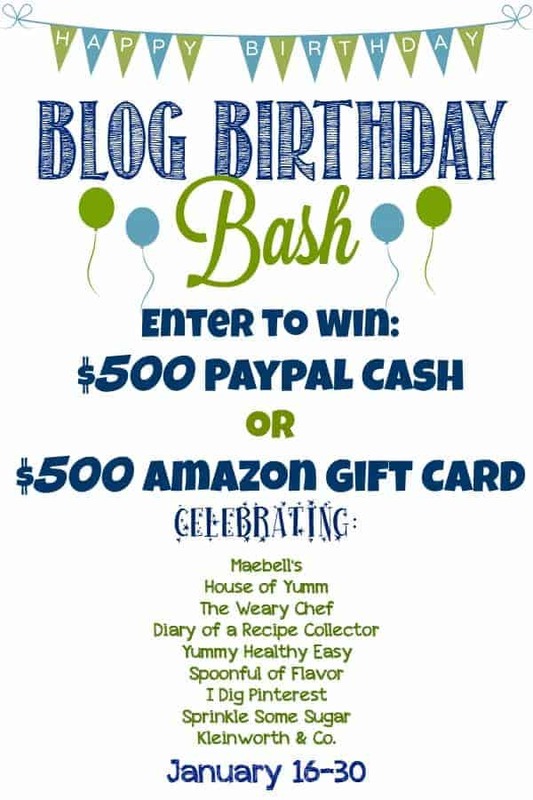 We thought it would be fun to celebrate these wonderful blogs by giving you a chance to win some cash!! The lucky winner will get their choice of $500 Paypal Cash or a $500 Amazon Gift Card!! Don’t forget to check out our awesome sponsors!! I Dig Pinterest – House of Yumm – Spoonful of Flavor – Kleinworth & Co. I don’t know how you do it all either! I can barely do mom of a cat and food blogger sometimes, haha! 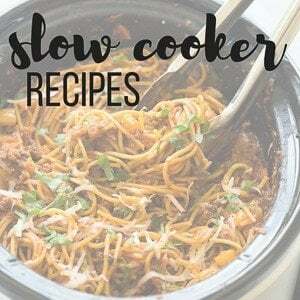 I still don’t own a slowcooker, but I’m looking into one because I think it would make my life so much easier! I don’t make my own spaghetti sauce much, but I think I need to start doing it more, this looks so good! Thanks Isadora! 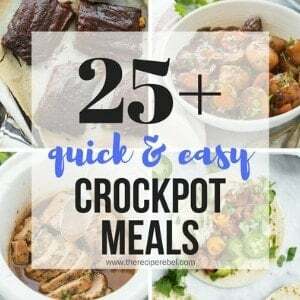 I can’t believe you don’t have a slow cooker — it’s pretty much my favorite thing ever. Especially for soup, and I love soup in the winter! Balancing out motherhood and blogging is tough, especially with a newborn! Easy dishes like this are always welcome because life is way too hectic to go with fussy dishes all the time. This looks delicious, Ashley! Love this easy recipe, Ashley. And you totally deserve some time for you and your girls. I don’t have kids and I hardly have a free time. I simply admire moms, like you! Thanks Christina! I’m lucky enough to be able to test some recipes from Campbell’s and this is one of our favorites! Aw, congratulations! And that is so great that you are taking some time to spend with those sweet little ones. They grow so fast, you’ve got to enjoy this time while it lasts. 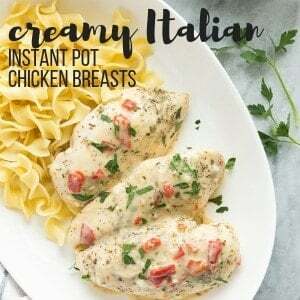 This recipe looks like a great one that would please the whole family! Thanks for the awesome giveaway too! Thanks Allie! It definitely goes by too quickly! I could eat spaghetti every day during the winter. This sauce looks incredible and I love that it is made in a slow cooker! Ashley, I am happy that you are taking time out to rest and be with your girls. You need it! I was wondering where you were on Wednesday too. I stopped by to say hello. 🙂 Great minds think alike too. We both posted pasta today. 🙂 This looks delicious and I need to make this asap. I love the veggies!! Yum! It makes it healthy right? 🙂 Happy weekend friend! Thanks so much Cyndi! I feel like it’s necessary right now, and I’m looking forward to trying to relax a bit! Even though I’ll probably just spend the extra time on Pinterest or something…. Lo. YUM!! Gotta love whippin out the slow cooker in the chilly days of winter! This looks delicious! Gotta love fresh pasta sauce! YUM 🙂 Great recipe! Thanks Cailee! I’m obsessed with my slow cooker! You sure do have your plate full! My daughter is 16 – kids grow up too too fast so enjoy all the time you can with your adorable girls! Btw – those veggies make me wanna eat this sauce sans pasta! Thanks Stacey! She’s a sweetheart! Thanks Kelly! We really enjoyed the recipe — hidden vegetables are the ones I enjoy the most! Good for you for taking more time to spend with your family! You take all the time you need, don’t feel pressured to post a ton every week. 2 posts a week is still really great! And I’m glad your husband was able to be with you for 6 weeks. That’s amazing. Bet it really helped with the transition from 1 to 2. 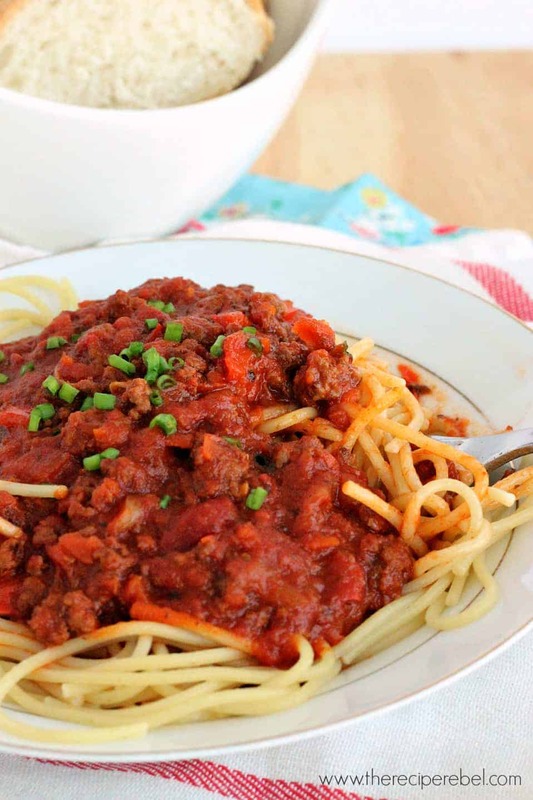 This slow cooker spaghetti sauce sounds amazing! Thanks Natalie! It was really awesome having him around! It is nice to get back into “routine” though, even if life is a little crazy sometimes. 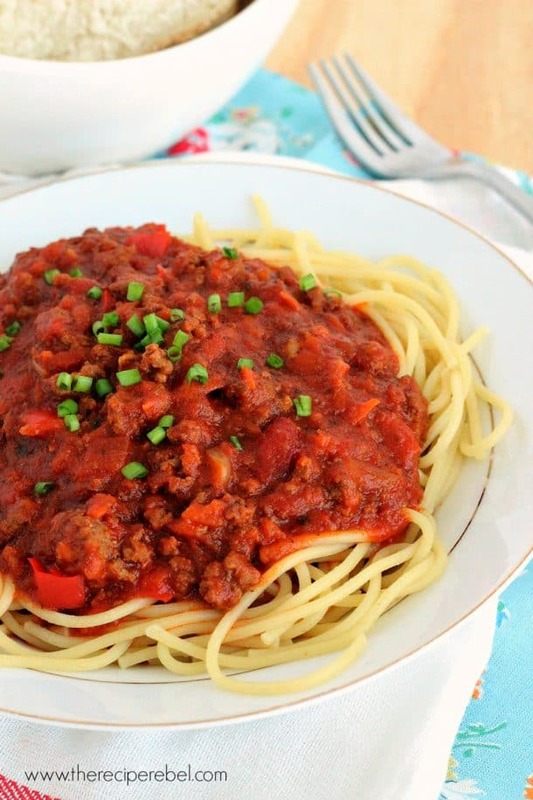 I’m kinda craving this spaghetti for breakfast right now! What a great idea to make the sauce in a slow cooker. Love this, Ashley!